Given the widespread use of polymers in medical devices, the durability and reliability of this material in use is an area of critical importance. 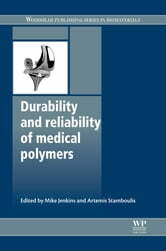 Durability and reliability of medical polymers reviews the performance of both bioresorbable and non-bioresorbable medical polymers. Part one provides a review of the types and properties of bioresorbable medical polymers. The effect of molecular structure on properties is discussed, along with the processing of bioresorbable and other polymers for medical applications. Transport phenomena and the degradation of bioresorbable medical polymers are reviewed, before an exploration of synthetic bioresorbable polymers and their use in orthopaedic tissue regeneration. Part two goes on to explore the durability and reliability of non-bioresorbable medical polymers, and wear processes in polymer implants and ageing processes of biomedical polymers in the body are discussed in depth, before an investigation into manufacturing defects and the failure of synthetic polymeric medical devices. 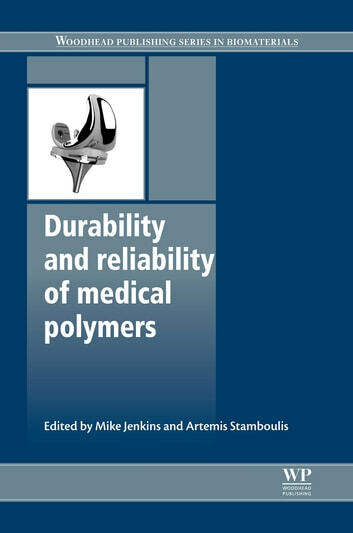 With its distinguished editors and international team of expert contributors, Durability and reliability of medical polymers is an essential tool for all materials scientists, researchers and engineers involved in the design, development and application of medical polymers, whilst also providing a helpful overview of the subject for biologists, chemist and clinicians.